Louder Than War issue three - out now! | Louder Than War Louder Than War issue three - out now! Louder Than War issue three – out now! 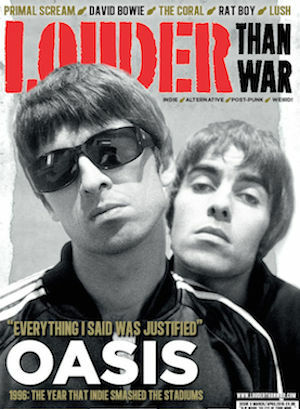 The latest issue of Louder Than War magazine is in shops and available to order online now. The third issue of our magazine marks us moving to becoming a bi-monthly publication with six issues each year. In this month’s issue you can look back at 1996 with a retrospective on the year Oasis took indie to the stadiums. Also featured in our pages are Primal Scream, David Bowie, The Coral, Rat Boy, Lush, Bis, LIINES, Deftones, Swim Deep, Tuff Love, The Wonder Stuff, James, Kula Shaker, Slaves, Skunk Anansie, Explosions in the Sky and Drive Like Jehu. You can pick up your copy from WHSmith and independent newsagents or you can order online (worldwide shipping available). Follow the magazine on Facebook for the latest info between issues. Where can I get a physical copy…. P’dilly records, oldham st? WH Smith are national stockists.